Tom and Charlie have decided to live out the remainder of their lives on their own terms, hidden away in a remote forest, their only connection to the outside world a couple of pot growers who deliver whatever they can’t eke out for themselves. But one summer two women arrive. 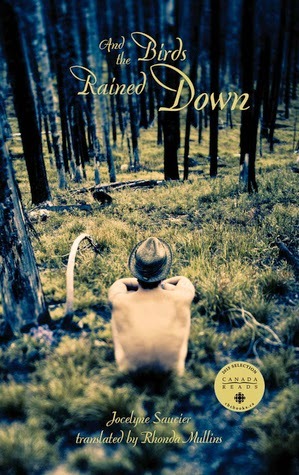 One is a young photographer documenting a a series of catastrophic forest fires that swept Northern Ontario early in the century; she’s on the trail of the recently deceased Ted Boychuck, a survivor of the blaze. And then the elderly aunt of the one of the pot growers appears, fleeing one of the psychiatric institutions that have been her home since she was sixteen. She joins the men in the woods and begins a new life as Marie-Desneige. With the photographer’s help, they find Ted’s series of paintings about the fire, and begin to decipher the dead man’s history. A haunting meditation on aging and self-determination, And the Birds Rained Down, originally published in French as Il pleuvait des oiseaux, was the winner of the Prix des Cinq Continents de la Francophonie, the first Canadian title to win this honour. It was winner of the Prix des lecteurs Radio-Canada, the Prix des collégiens du Québec, the Prix Ringuet 2012 and a finalist for the Grand Prix de la ville de Montréal. There were three themes/aspects of this book that I quite enjoyed: mystery, history and freedom of choice. Trying to figure out Boychuck's past life was like piecing together a puzzle without knowing what the finished product was supposed to look like. The photographer, who is snooping around Tom and Charlie's hidden community, reveals that she is photographing those who were impacted by a slew of wildfires that plagued Northern Ontario. She is specifically interested in finding Boychuck because he has become somewhat of a myth connected to the The Great Matheson fire in 1916. She is greeted with unfortunate news in her first interaction with Charlie. The freedom to choose how to live and when to die, despite your age, is another theme that is very evident throughout the story. Tom, Charlie and eventually Marie-Desneige abandon their past lives to form their own community by the lake. Their secret is kept safe by a few of their trusted friends. The story also leaves room for a bit of love and romance, but you'll have to pick up the book and read about it for yourself. There are too many spoilers to be had if I were to elaborate. After I read the first chapter, I wasn't feeling the book. I thought it was one that I would have to force myself to finish. I'm so glad that I kept going! The budding relationships between the characters and learning about their individual pasts is what got me hooked. This is the third of five Canada Reads books that I have read this month. I'll be posting a summary of which book is my pick to win once I've read them all. Intolerable by Kamal Al-Solaylee is next.